Order your annual holiday party invitations and greeting cards through JLW Marketplace and 15% of your order goes back to the League. There are dozens of designs, ranging from traditional to modern – you can even customize your envelope liner! 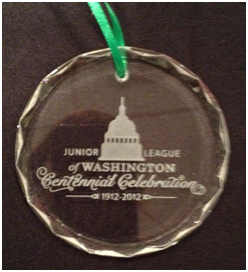 Decorate your Christmas tree with a beautiful JLW Centennial Celebrations glass ornament – priced at $35. These commemorative ornaments would make a lovely gift for a fellow JLW friend or even Junior League family members back home! Here are some more JLW Centennial Celebrations items – these convenient May Books (www.maybooks.com) notebooks, only $8, would make a great gift for your favorite woman on the go! May books’ notebooks were featured on Good Morning America. 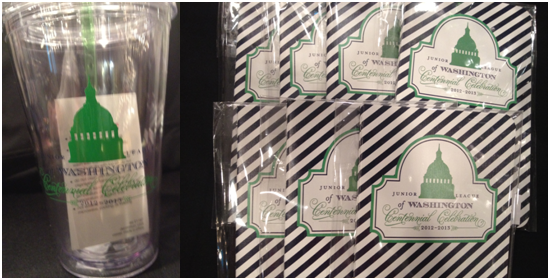 Ditto for this acrylic tumbler with lid and straw available for $20. Who doesn’t love a great monogram? 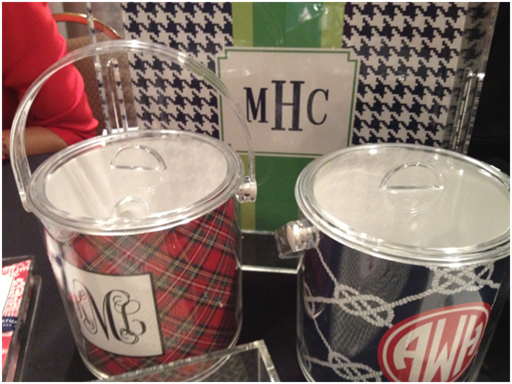 Gift your friends and family with these adorable acrylic monogramed ice buckets and lucite trays. These would make a great holiday or wedding gift for the newlyweds in your life. And show off your JLW love around town in this zip up jacket $75, or with a JLW branded Vineyard Vines canvas bag. Bags are $95 and the matching keychain is only $25. 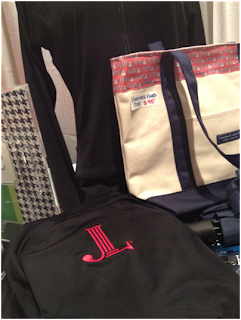 To purchase any of the JLW items above, email JLW Marketplace at jlwmarketplace@gmail.com.